Meet your new favorite way to enjoy Buffalo Chicken Dip! This party favorite is easier than ever and the pressure cooker locks in all the delicious flavor so much faster. 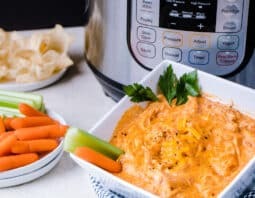 Have you made buffalo dip in the slow cooker only to find cooking it that way eats up all the sauce and the dip turns out dry? 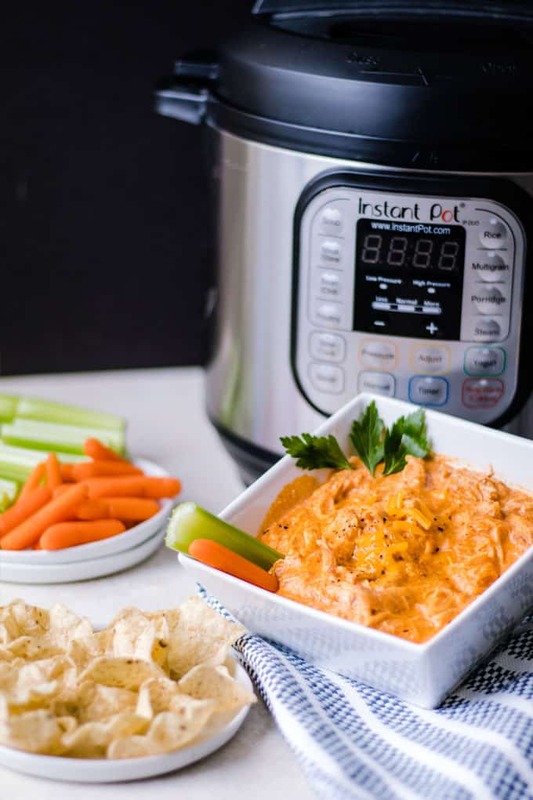 One of the reasons buffalo dip is so amazing in the Instant Pot is because it’s creamy, spicy and full of flavor. You don’t lose a bit of that saucy goodness. We all have busy lives, which makes this dip great to throw in the Instant Pot last minute before your guests come over for game day or just for a casual hang out. It means you actually get to enjoy the game instead of working in the kitchen. There are several options you can use to make this. You can use chicken breasts and shred them after they cook. Or you can buy pre-shredded chicken at the store. Just know, when the stores pre-shred your chicken they typically knock up the price. However, the convenience just might be worth it. We suggest serving buffalo dip with tortilla chips, crackers, carrots and celery. Or just straight off a fork. What are some of your favorite snacks to enjoy on game day? Let us know! Place chicken, cheese, cream cheese, yogurt, hot sauce (if making homemade buffalo sauce, whisk together those ingredients in a small bowl first), nutritional yeast and seasonings in the Instant Pot. Cook on manual high pressure for 15 minutes. Do a quick release by using tongs to switch the Instant Pot from sealing to release. Shred the chicken with a fork and serve with chips or veggies!